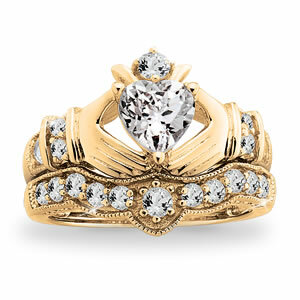 “With these hands I give you my heart and crown it with love” is the sentiment of the Claddagh wedding ring tradition. Award-winning designer Marjorie Andes has captured this enduring legend in this brilliant Sterling Silver Wedding set lavishly plated in 14K Gold. The engagement ring features a heart-shaped White Topaz gemstone and the companion tiara style wedding band is set with sparkling White Topaz. Wear this special ring as a symbol of everlasting love.